Hair ornaments have a long tradition within Native American cultures. These ornaments are most likely from the Upper Northern Plains region. 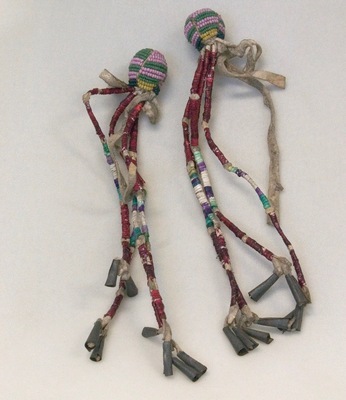 They were recovered from a box of objects that was almost discarded at UND, and rescued by former American Indian Studies secretary, Merry Claymore Ketterling. They are illustrated in the book Storytelling Time: Native North America Art from the Collections at the University of North Dakota (Hudson Hills Press, 2010).